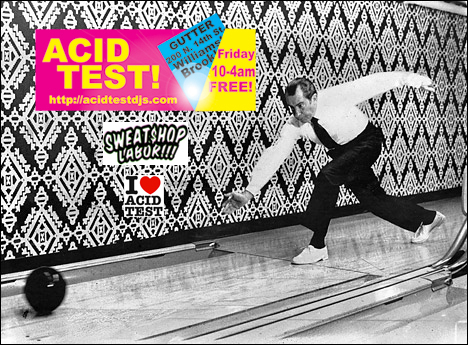 Thursday September 25th, the legendary Acid Test DJs do a one off Acid Test at Fontana’s. DJs Spiritbear and Udagawa spin tracks from their world reknowned blog, http://www.acidtestdjs.com as well as from their collective, mind bending music collections. Swing by and get weird with us! The Original Acid Test! This Friday as well as every Friday at Gutter in Brooklyn. Your hosts The Acid Test DJs Spiritbear, Udagawa, Coach and Tim Love Lee rotate on the decks from 10PM to 4AM. Also, 8 lanes of bowling in the next room and beers from around the world to sample. Come out and get down in front of our dubwise sound system!! !